Living with my mother has many perks – you can always expect fresh fruits, vegetable juices and almost fat-free meals. With plenty of organic food to eat at home, I tend to steer clear of organic food outside because it is often expensive and not as tasty as shoving a spoonful of pork lard into my mouth. Mum and I recently visited an organic cafe which impressed me with its food. 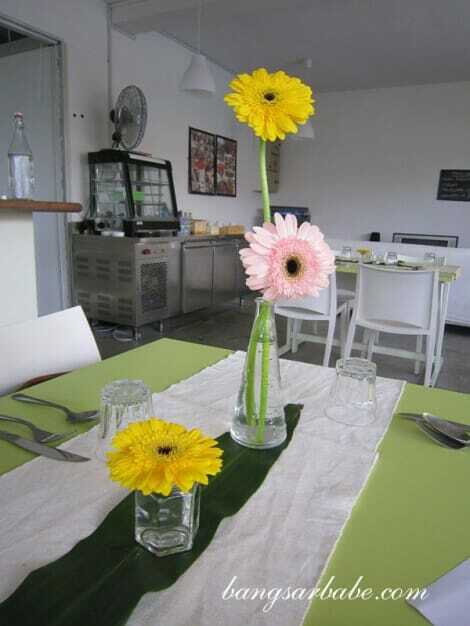 Croisette Cafe is a new organic eatery in Cascadium Condominium, Bangsar, that serves mostly French food. The place is small, cosy and simple – perfect for quiet meals and lazy weekend lunches (however, Croisette is closed on Sundays). To start, mum tried the wild mushroom soup and I, the golden pumpkin veloute (each soup is RM12). I expected them to taste bland, but they were anything but. 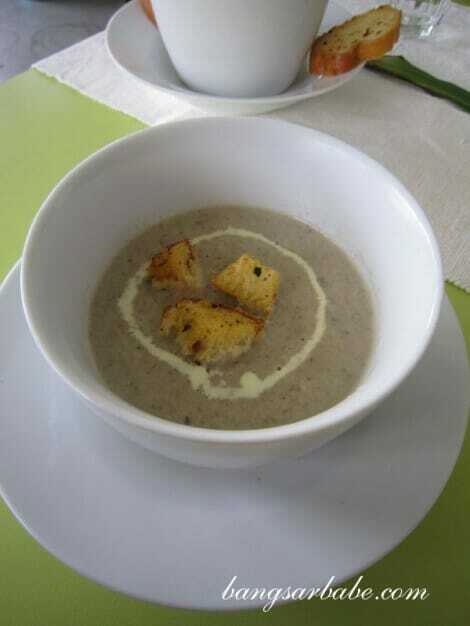 The mushroom soup was thick and full of flavour from the assorted mushrooms and herbs. 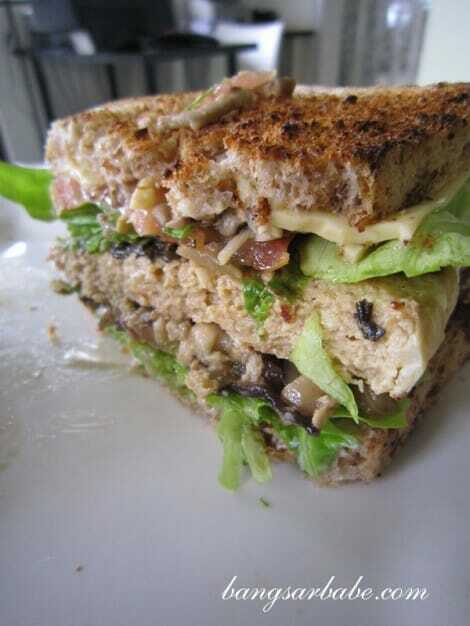 No cream was used – the thickness came from the generous amount of fresh mushrooms. 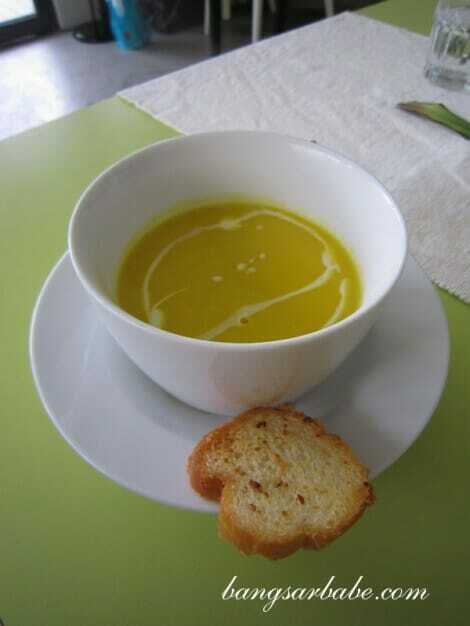 My pumpkin veloute was creamy with a natural sweetness from the pumpkin. It was hard to believe the soups were organic. 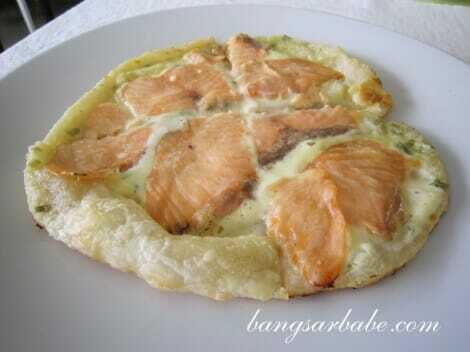 The smoked salmon rotizza (RM16) reminded me of a flaky roti canai with cheese and smoked salmon slices on top. It’s best to share this, as the combination of cheese, smoked salmon and pastry is a lot for small eaters. Spaghetti Pistou with dried tomatoes (RM11.50) was highly recommended by the owner Michelle, and rightly so. 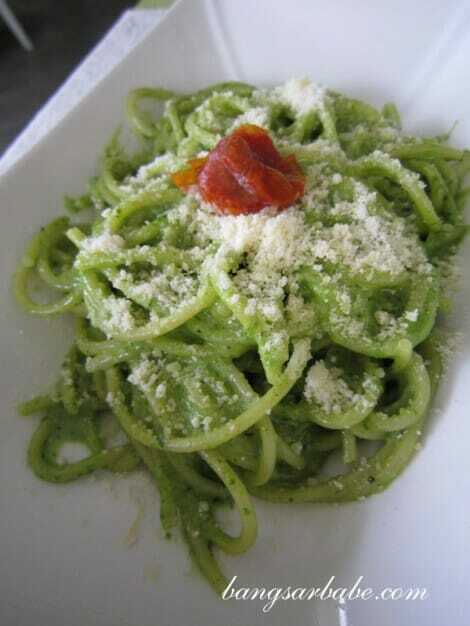 This was a simple yet flavourful dish of pine nuts, basil, sun-dried tomatoes and parmesan cheese. If you prefer, you can ask for some chicken slices in the dish. Another highly recommended dish was the free-range chicken burger, but the stubborn cow in me hesitated to order it because it uses Adventist bread. Mum eats that all the time, but I call it “food for the birds” because of the amount of nuts used. 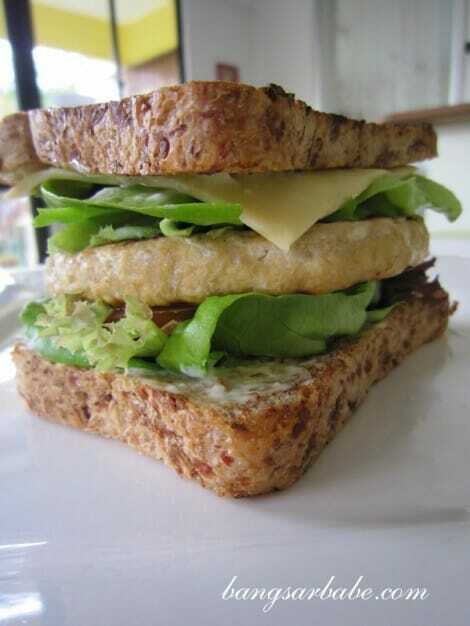 However, I ended up eating more than half of the sandwich. The chicken patty had a good bite, was nicely seasoned and the thickness was how I liked it. It also came with a slice of cheese, grilled mixed mushrooms (additional RM4) and fresh vegetables – filling, healthy and delicious. 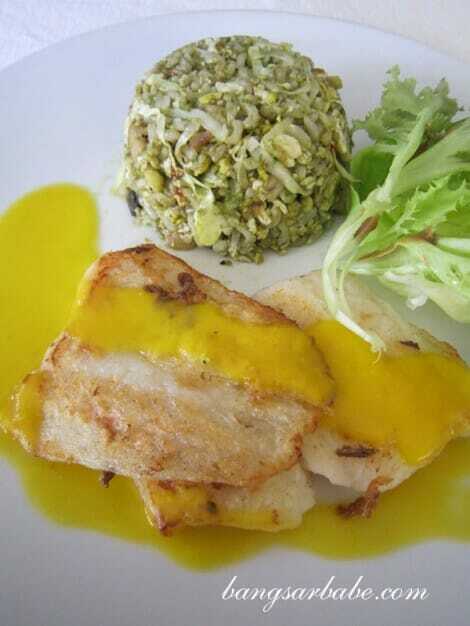 My mother wanted the fish dory fillet with pumpkin sauce (RM16) and opted for the organic fried brown rice on the side. I can’t believe I’m saying this, but I’m willing to skip the oily, greasy fried rice at my regular tai chow restaurant for this fried rice. I didn’t care much for the dory fillet though, but my mum enjoyed it. 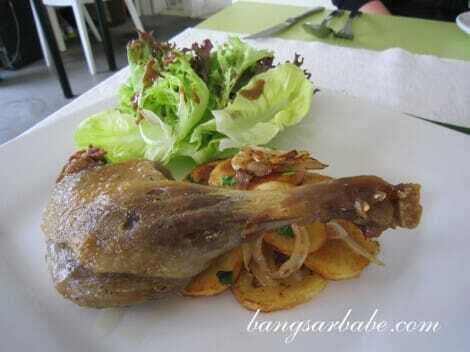 The free-range duck confit (RM28) was more to my liking. It came with potato sarladaise and a garden salad with homemade balsamic dressing. The dish had a delicious balance of flavours. The duck had crispy skin and tender flesh. Potato sarladaise, a traditional French dish comprising three main ingredients – potatoes, garlic and duck fat – was delicious. I couldn’t believe this dish was organic. 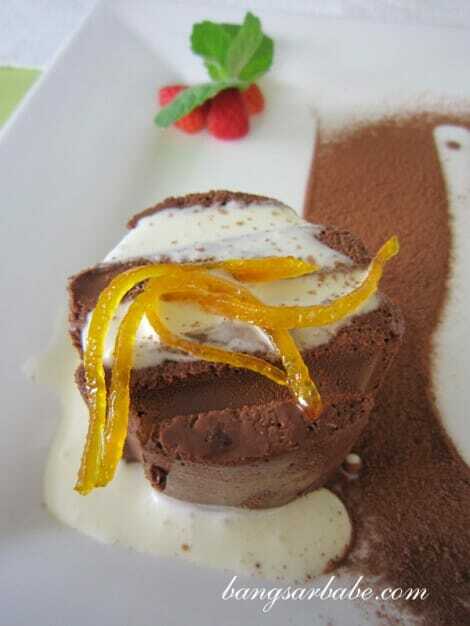 Dessert was the Tiramisu Croisette (RM16.50) and Chocolate Orange Parfait (RM10.90). I really enjoyed the latter, which was smooth, dense and not overly sweet. 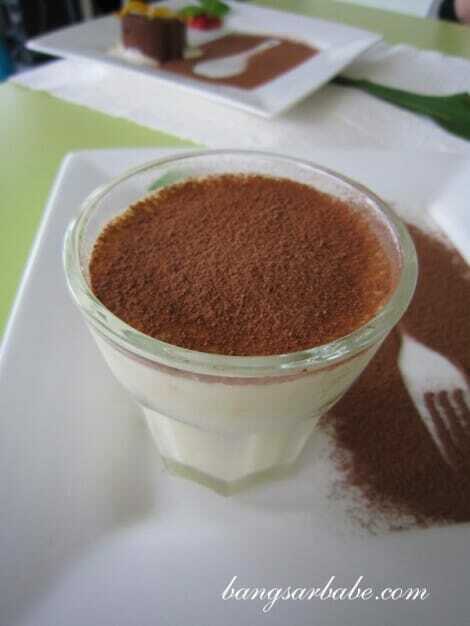 The tiramisu would have been better with alcohol, but that’s just me being picky. Croisette Cafe also does home delivery, so order away, All in, this was an organic meal to remember. The fact that I forgot this was organic says a lot about the food. Try it for yourself and let me know what you think! *Read my Star2Sunday column on Croisette Cafe here. Verdict: The food is so flavourful, you wouldn’t believe it’s organic! It definitely changed mine. I can’t wait to go back for more. Wanna join? 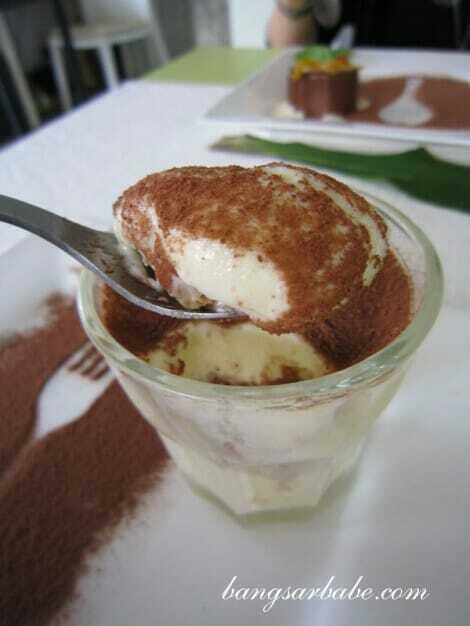 don’t worry i love my tiramisu with alcohol too! Are there any landmarks around the shop? Taste wise, is it as sweet or salty as non-organic food? It has a good balance of flavours. Not overly sweet or salty. Mostly natural flavours and herbs. The cafe is in Cascadium Condominium. 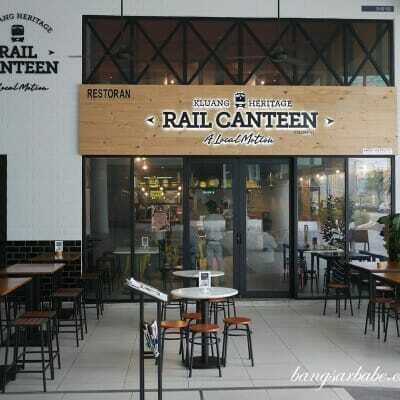 Very near Bangsar Shopping Centre. You can refer to the GPS Coordinates which I’ve included in the write-up, as well as an attached google map. No prob. 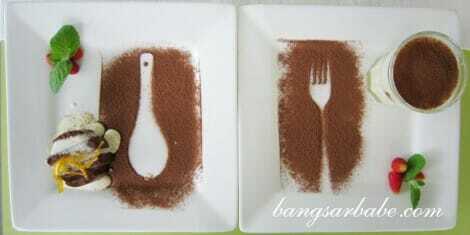 Enjoy your lunch! Are you sure you weren’t there at the owners’ invitation, or during a pre-catered function? The food there is NOTHING like in your pictures. It took a good 20 min. for them to prepare, and we were the only two people there. The other four at another table by the pool were just having a drink. 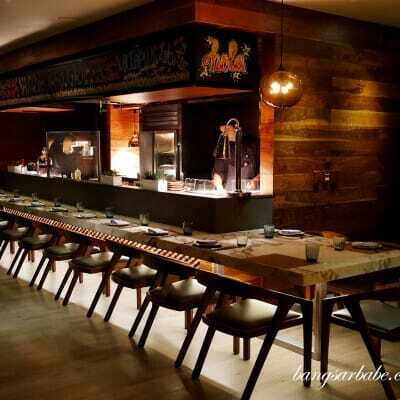 One of the owners told us that all the staff were on leave (which is rather strange, but it happens I guess). I had purposely ordered the day’s special, hoping we wouldn’t have to wait long, and when the food arrived, it is quite obvious that the waiting time was for the food to be thawed and reheated. The lasagne (not the day’s special) was still frozen at the bottom, and the rotizza pescatore (the special) was covered with cheese that you’d hardly notice the seafood on it. My spoon was also dirty. It was lucky that I had not come with six other people. They did not agree on the venue because they think parking would be a problem (it wasn’t) and they didn’t know anyone else who has been there. I was particularly disappointed that the lemon tart had not been crossed out from the board, but it was not available to order. It was around 1 p.m.–they had plenty of time to update the menu on the blackboard even if there was no staff. The lady owner(?) was very encouraging on the phone and had told us to come, and she was hospitable while we were there. (The other was sullen.) She could’ve told me her staff didn’t turn up, we wouldn’t have come, and I wouldn’t be writing this negative feedback. Sorry you had such a bad experience. I was there on my own, after learning about this place via email. Do let the owner know about this ([email protected]) and I hope they will rectify this problem. I’ve also heard complaints from my other readers regarding Croisette, so they need to buck up.